Two young children dying in Groton in August 1775. Was this the beginning of the dysentery epidemic behind the American lines? Ah-hah. Thanks J.L. That appears to be a piece of the puzzle in my family tree. My 5G-grandmother Love(Wheeler) Leeman died 15 Aug 1775 at the age of 47 in Hollis, N.H., very close to Groton, Mass. Her son, Samuel Leman, had served at Bunker Hill. Perhaps he brought dysentery home to Hollis? Samuel was later commissioned an ensign and was KIA in the Battle of Hubbardton on 7 Jul 1777. Those were perilous times in the Groton/Pepperell area. If the war or the dysentery didn't get you, you still had to worry about Old Leadfoot Blood terrorizing the roadways with his reckless cart driving. Even his own family members couldn't get out of his way fast enough. 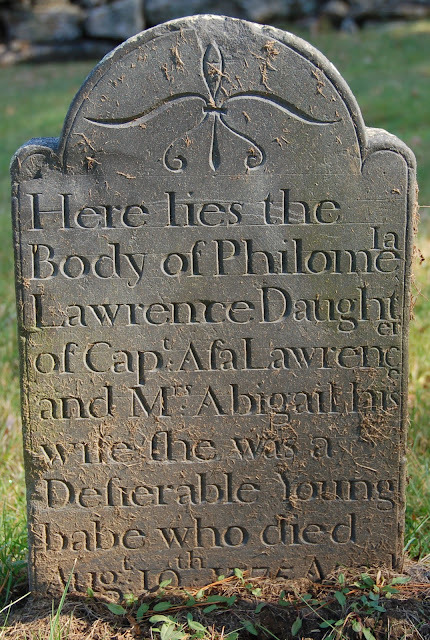 If you scan Green's Epitaphs, which Caitlin links above, it looks like 18 children and young adults died in Groton in August 1775 -- a very high number. And at the beginning of September an elderly widow who fled Newton "on account of ye civil war" and who "was removed by a dysentery to that place where ye wicked cease from troubling & ye weary are at rest." Interesting to note on page 68 of Green's Epitaphs that Susanna Quailes, died 11 days after her daughter Peggy, and also that Susannna reportedly took part in the apprehension of Leonard Whiting, which J.L. recently wrote about. Tradition says that she was one of the patriotic women, who, in April, 1775, arrested Captain Leonard Whiting, of Hollis, New Hampshire, near what is now Jewett's bridge, over the Nashua River. He was a noted tory and a bearer of despatches from Canada to the British in Boston. Darn, you guys are jumping all over my scheduled posts! Look for Susanna Quailes in about a week and a half and Abigail Kenrick here.